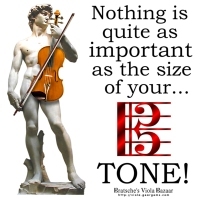 Get it now for your favorite violist – maybe that’s you? – on a t-shirt, hoodie, poster, bag or other quality apparel or giftware item, exclusively from Bratsche’s Viola Bazaar! Here is the design on products printed by PrintFection (please click).